India is known to be a land a of cultural heritage and religious sites. You shall witness a lot of shrines and monuments in different parts of the country, each better and more marvelous than the other. They speak volumes about the rich archeological history that the country has always had. One such famous sites is the Golden Temple in Amritsar. The Golden Temple, also known as the Harmandir Sahib, is the most important shrine of the Sikh religion, which attracts millions of tourists from around the world, not only from the Sikh religion but all the other religions too. The beautiful gurudwara is located in the holy city of Amritsar and is among one of the top tourist destinations in the country today. The temple boasts of extreme beauty and is of great spiritual significance for the pilgrims who visit it. #1. The name Sri Harmandir Sahib literally means the “Temple of God” and reflects the true meaning and purpose of this majestic shrine, which stands for treating God as one and making no distinction among His worshipers on the basis of cast, color, creed and religion. 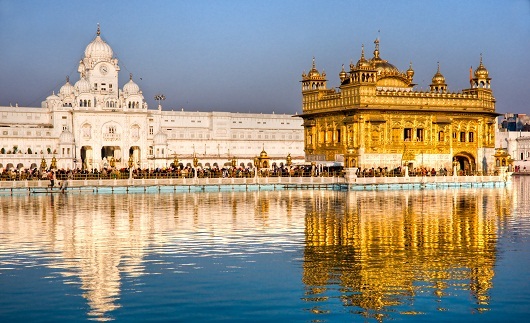 The temple is also called the “Darbar Sahib” and the top of the shrine is made of pure gold. The Golden Temple was actually founded by the fourth Sikh Guru called Guru Ram Das in the year 1574. #2. Another fact about the temple, which reinforces the oneness of all people and religions, is that the temple has entrances from all the four direction, which signifies that people of diverse backgrounds are allowed to make an entry to the gurudwara, which welcomes them all with open arms. In fact, it is known that out of hundreds and thousands of pilgrims who pay visit to the holy shrine each year, 35 percent are from faiths other than the Sikh religion. #3. The foundation of the gurudwara was amazingly laid down by a Muslim sage called Mian Mir in December of 1588, though its construction was started by Guru Ram Das in 1588 and completed by another Sikh Guru, Guru Arjun Dev. The Gurudwara was completed in the year 1604. The Golden Temple was built at the same site where first Lord Buddha, and later on Guru Nanak used to perform meditation. Guru Nanak was the first Guru of the Sikhs. #5. Next among the most unusual facts about this world famous temple is that it is made of white marble, embellished with real gold, which is why it gets the name of Golden Temple. The lower level of the shrine has marvelous work and is a combination of Hindu and Islamic styles of architecture. Above the first layer, the second layer is made of gold designs and has as much as 750 kilograms of gold. However, the temple was initially built without gold. Maharaja Ranjit Singh, who ruled during the 19th century got the entire monument renovated. The temple has been destroyed on numerous occasions. However, each time the Holy shrine was rebuilt more beautifully than the previous time. Today, it stands as one of the most beautiful human creations. #6. 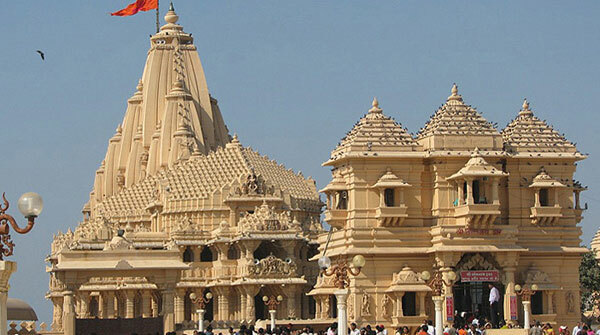 Structurally, the temple is located on a level below the ground level as it signifies that one must be humble and go down to reach the temple of God. This design is quite opposite to that of the Hindu temples, most of which are built at an elevated level. The design of the temple has been well-thought of and it represents what it preaches. #7. The temple was devastated again and again, first by the Mughals and the Afghans and later during a clash between the Indian Army and terrorists in the Operation Blue Star of the eighties. But it has now been renovated and stands as a mark of glory and splendor of the Sikh religion. #8. The main hall of the Golden Temple houses the Guru Granth Sahib, the sacred scripture of the Sikh religion. It is placed on a raised platform under a canopy studded with precious jewels. The sacred book of the Sikhs is a collection of many holy prayers, poems, as well as various hymns that were originally composed by the various Sikh gurus and Muslim saints. #9. The Golden Temple has been a monument of worldwide fame on account of organizing the largest langar sewa in the world, where more than 35000 people are fed on a daily basis. In fact, the Langar that is served on special occassion s and religious events is known to serve as many as 2,00,000 people. The food prepared and all arrangements done are from the donations received from the followers of the Holy Temple. #10. Finally, the gurudwara also houses the acclaimed Central Sikh Museum, which contains relics and art works related to the Sikh religion, its great saints and warriors. With mosaics and paintings that have been painted in hand by all the followers, the Golden Temple is one of the most beautiful shrines that India houses. Today, the Golden Temple has become a much sought after destination on the tourist map of India, not only for the Sikh devotees, but also people from all other parts of the world, without distinction of religion. It is one of the famous historical places of India.